Six time World Bowling Champion from the Philippines, and holder of three Guinness world records, Paeng Nepomuceno recently sold his Confente track bike. Paeng said, "It had been on display in my trophy room and I had not been using it anymore. I have been cycling for more than 20 years and cycling is part of my cross training and fitness program for stamina and leg strength which helps my bowling a lot." Paeng originally purchased the bike from the well known Brian Baylis. Baylis recounts some of the history of the frame, "Here are the real answers to your questions. 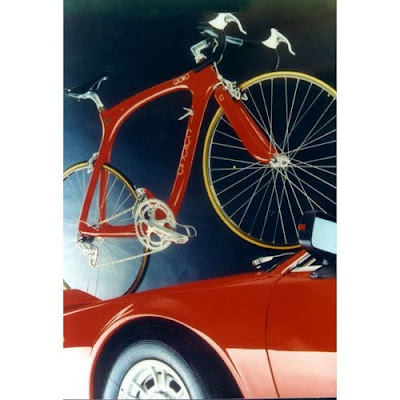 That is a real Confente, frame #24 from LA.....I intended to keep it in my collection....the bike is 61cm which I could never ride, but I wanted an example of Mario's work. It was made as a frame for stock in NJ, at Rexart Cyclery. It was intended to be a fixed gear road bike from the very beginning, it is not a converted track bike; although it was ridden on the track during it history." I've written many articles about Confente and Confente bikes. Please use the search feature to the right to find them. Stories for the Italian Cycling Journal about rides, granfondo, having a good time cycling in Italy, Italian cycling history, etc. are very welcome. Contact me at veronaman@gmail.com. There are more than 1,300 stories in this blog. The search feature to the right works best for finding subjects in the blog and there is also a translate button at the bottom so you can translate each page. Pleasing a master and perfectionist is never easy, if your father is the famed bicycle builder Ugo DeRosa, it’s a downright terrifying prospect. Doriano DeRosa started building frames in 1975 as a teenager under his father’s severe gaze. Thirty-five years later, he’s the craftsman in charge. In the opening seminar of this year’s NAHBS, Doriano explained how the family model of demand and nurture employed by his father in his own upbringing is applied to his craft as DeRosa’s head titanium and steel framebuilder. DeRosa explained the eight steps on the path to building a frameset that bears his family’s name. First, the customer is meticulously measured. Second, these careful measurements are converted into customer-specific tube lengths and frame geometry with the aid of CAD software in a process he calls “projection”. The next two steps are the most critical, especially for a titanium specialist like Doriano DeRosa. The raw tubes are “mitered”, or cut angularly, with the help of precision machines. Next, the tubes are fitted together on alignment tables in the “positioning” step. This is a crucial and exacting step for the lugless Ti and steel frames in which DeRosa specializes, because there is no room for error to produce a solid, strong tube joint. Next, the tubes are cleaned and welded in a pristine environment – again an especially important step to get right for a titanium specialist like DeRosa, and one at which many less experienced builders stumble. Finally, the frame’s alignment is checked, and its durability and quality are tested in a rigorous process that again employs a combination of cutting edge technology and the immeasurable intuition of a craftsman. “For me, weight is not as important as durability and strength” says DeRosa. That those two latter ideals are emphasized is shown by the results of DeRosa’s in-house stress test. A DeRosa frame constructed from 6/4 blend titanium tubing has been shown to be theoretically capable of withstanding 200kg (440 lb.) dynamic force cycles repeatedly and constantly for 400,000 years before fatigue will cause breakage! Much as keeping the business a family affair is important for DeRosa and his two brothers, having a strong relationship with titanium tubing supplier Reynolds is strongly valued and has been cultivated over 10-12 years of working together. DeRosa built his first Ti frame in 1993, and in 2002 made the switch to 6/4 alloy titanium – stronger and stiffer than its more popularly used 3/2.5 alloy brother – all sourced by Reynolds. So there you have it: invest some (serious) cash in high-tech frame design tools and follow the eight-step process and you’ll have your own version of a DeRosa, right? Not so fast, Doriano cautions. “Being a framebuilder is not just about making the frame. It’s about putting your philosophy behind the design. It’s about developing and making your own tools if the right ones don’t exist. It’s about being open to new technology. It’s about…” DeRosa’s hands grasped at an imaginary frameset in the air as he struggled for words in his highly self-underestimated English. It’s about heart and soul. You’re born with it; it’s not earned. 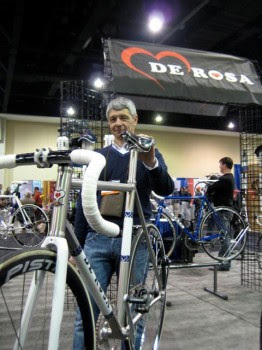 So if you want to build a DeRosa, you’d better be a DeRosa. See this story for a series of photos showing Doriano building a Ti frame set. The Bicycle Guide of October, 1986, featured the story "Seduced. A Trip Through Italy's Heart and Soul" and road tests of Masi, Pogliaghi, De Rosa, Bianchi, Sannino, and Bertoni bikes. On the cover were Lisa Melilli with a De Rosa. "The iconic style magazine 'Wallpaper' has selected Colnago’s ultra-stylish Super single-speed bike as a winner in its 2010 Design Awards. The Super’s head-turning looks earned it selection in the Best Rides category of the prestigious awards. Inspired by track bikes of the 1980s, Colnago’s Super harks back to the company’s artisan heritage with its classic lugged steel frame. Chromed lugs at the head tube and fork crown boost its eye-catching qualities. Sporting a flip-flop hub that gives the choice between fixed wheel speed and single-speed cruising, the Super fits in with the growing demand for simple urban bikes. Beautifully finished in cream with dark red panels, the Super’s head-turning looks are completed with a Vintage brown leather saddle and tan-coloured bar tape. Colnago’s long-established build quality ensures that the Super can cope with potholes, while its tight geometry make it ideal for zipping through busy city streets." 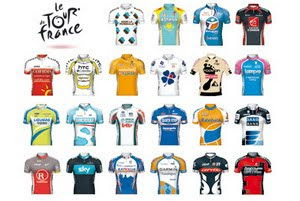 ASO, the organizers of the Tour de France, that will take place from the 3 to 25 July, 2010, have just announced the 22 teams selected that will start the race in Rotterdam on Saturday, July 3rd. Beginning in 2011, in compliance with the agreement passed between the organizers of the three main Tours and the International Cycling Union (UCI), the first 17 teams of the world ranking established at the end of 2010, according to the sporting results of the teams, will be automatically selected. The other teams will receive wild cards from the organizers. A series of events to promote Italian vintage cycling, this is the objective of the "Giro d’Italia per bici d’epoca" (Giro d'Italia for vintage bikes). The series is a result of a collaboration between the leaders and organizers of Italian vintage bike events. They met on March 14 to form the organizing committee and to undertake the creation of the regulations. 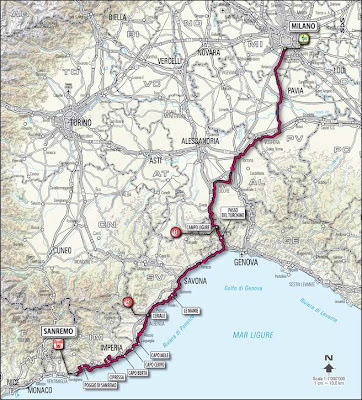 The "Giro d’Italia per bici d’epoca" will be a series of twelve events that will take place from 18 April to 10 October, 2010. At the conclusion of the series trophies will be awarded to individuals and to one team (the basis of scoring system was not yet specified). Participants for the awards must enter at least four "ciclostoriche". 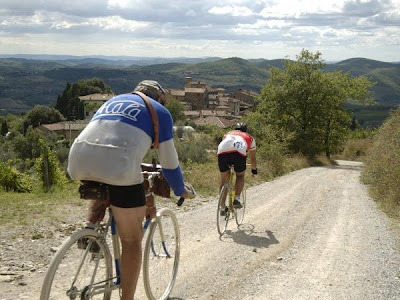 The award ceremony will take place in Gaiole in Chianti October 2, 2010, during the L'Eroica. The participation in the "Giro" is open only to amateur cyclists and collectors of vintage bikes of all types that were built before 1985. Bikes should have on-frame shifters (no modern day brake/shifters), external cables, and pedals with toe straps. Enrollment is open to cyclists of all ages and all nationalities. Riders must wear wool cycling shorts and jerseys in accordance with the period of the bicycle. The leaders of the initiative, in order of participation, are: Loredano Petronici, Gianluca Ghiretti, Andrea Baldan, Federico Viola, Giuseppe Nardini, Diego Tambosi, Piero Ancillotti, Carlo Studlick, Rolando De Cecco, Marco Selleri and Alessandro Faggiani. I'll publish more information as I learn of it. "La cannibale", Marianne Vos (NED-Rabobank), gave an encore performance on via Valcuvia in Cittiglio on a sunny Spring day to win the Trofeo Alfredo Binda, the first women's first World Cup race of 2010. Only a few weeks ago Vos also won the women's cyclo-cross world title. "I am happy to repeat the success here at Cittiglio", said Vos happy after the race. "Today, I have had very strong opponents, large and enthusiastic crowds, and it was exciting to again raise my arms in victory." "More than that I just could not do", said Noemi Cantele, the first of the Italians in fifth overall. "I had four sprinters with me so I am still happy with my result." A friend of mine has been collecting data on bike brands, with a focus on the vintage, for quite some time now. To give you an idea of the extent of the data and how it is organized, below is just part of what is under "C". He hasn't made a final decision on how to market the Bike Guide but if you are interested contact him here. I suspect it will be fairly inexpensive. The Bike Guide is a great resource, particularly helpful in identifying lesser known brands and some models within brands. CACEG: Cadres, ACcessoires En Gros. Montreuil, France. CPR: Competition Performance Research, 3203 Fairacres Road, Huntsville AL 85805. 205-539-4801. Frames custom built by Marty Williams. CALBORN Marcel: Celo Europa, 1143 Manhattan Avenue, Manhattan Beach CA 90266. 26538 Moulton Parkway, Unit A, Laguna Hills CA. 714-643-2801. Made by Colnago. CALHOUN Cycle: Minneapolis, MN. 612-827-8000. CALOI: Sao Paulo, Brazil. 703 E. Ashley Street, Jacksonville FL 32250. 904-355-5547. Since 1898. A subcontractor to Eddie Merckx. Ridden by Lotto team in 94. Ridden by Motorola Team 95 to 97. CALZONE: Italy. Domenico Calzone. Trained by Giuseppe Pela and Armando Zago. Via Villa Giusti 6, Torino Italy. Imported by Frank Israils, Ft Lauderdale FL. Information, Dade Cycles, 305-444-5997. Most were green with yellow & gold. CAMERA: Italy. Marked A. Camera. Sold by Blue Wheel, Charlottesville VA.
CAMINADE, Pierre: 1910, Paris, France. Best known model was the Caminargent, introduced in 1936 with Octagonal aluminum tubes. CAMPANIA: Made by Fuji in Japan. CANNONDALE: 9 Brookside Place, Georgetown CT 06829. 800-BIKE-USA. Started with bags and trailers in 1970. Producing bicycles since 1983. Distinctive for oversize welded aluminum. Early forks were Tange chromoly. Later forks were aluminum. Known for stiffness. Oval chain stays. Size is measured from center of bottom bracket to 1 inch below TOP of seat tube. Later models, the seat stays join the chain stays in front of the rear dropout and axle. Model number was associated with component package. Higher number had higher quality component package. CARABELLA: Mexico. Owned by Windsor. CARBONFRAMES: 115 Post Street, Santa Cruz CA 95060. 408-459-6777. Carbon Fiber with titanium inserts and dropouts. Molded. Made Greg Lemond's 1992 carbon frames. CARDI, Ezio: Marconi, 60 in Bardolino, Italy. Built for himself from 1970-75, then for Bianchi. CARLTON: Nottingham, England. Run by O’Donovan family until Raleigh bought them in 1960. CARNIELLI: Italy. See Bottechia. Now only making fitness equipment. Early 1960s. The first shop was located at 43 Penton Street, London N1. In 1942, that address was bombed out and the business relocated to 52 Surbiton Road, Kingston. Few, if any, frames seemed to have been built during the war years as attention was turned to making munitions. Carpenters were considered to be high quality lightweight machines comparable with Ephgrave and Hetchins. Roughly 100 frames a year were built in the pre- and post-War years. CARRARO: http://www.carrarocicli.com/ Via A. De Gasperi, 15-35030 Saccologno, Padova, Italy. 011-39-49-801-5299. Founded in 1920 by Giovanni Carraro. CARRE Bernard: Montreuil, France. Built frames for Jacques Anquetil and other racers. CARRERA: Italy. www.carrera-podium.it Via Statale 52 – 25011 Calcinato (BS) Italy. Tel: 011-39-030-9964322 Manufacturing top-range bikes in the Carrera name since 1989. Carrera is the name of a major clothing brand that actively sponsored cycling for many years. Vagabond is connected to Carrera. CARTER, E.H.: England. Purchased Selbach. CASATI: http://www.ciclicasati.com/ Via Lecco 20, 20052 Monza (MI), Italy. 011-39-39-36-00-06. R&A Cycles, 105 5th Avenue, Suite B, Brooklyn NY 11217. 718-636-5242. Founded by Pietro Casati in 1920. Pietro's son, Gianni and grandsons, Massimo and Luca, continue to manage the company in Italy. Lugged steel. Superb alignment. Some have a distinctive tuning fork seatstay cap. Columbus tubing. Sloping fork crown. CASMANO: 4403 S.E. 52nd Avenue, Portland OR 97206. 503-774-3487. Custom. CASTELLON, Leo: 1320 Grand Avenue, Suite 12A, San Marcos CA 92069. 619-591-3830. Since late 1970s. Aluminum, Chromoly, and Titanium custom. Makes Quattro Assi aluminum. CAVALIERI: Verona, Italy. Taught many framebuilders including Gino Milani, Mario Confente, and Victorio Malagnini. CAVE L: Mid-tier constructeur, France, around 1950. CAYGILL, Arthur: England. Borough Road, Gallowfields Trading Estate, Richmond, North Yorkshire, England. Richard Kent was also a builder. CAYLOR, Gunnar: 519 Kansas Avenue, Modesto CA 95350. Began building in 1969. CAZENAVE: France. 1940s Constructeur. "Sam", Italy. CBT ITALIA: CBT International, Via Genova 15, 12010 Cuneo, Italy. Sloping fork crown. Extended seat tube. CCM: Toronto, Canada. Canadian Cycle and Motor Company. One model was the Redbird. CELMINS, Mike: Santa Barbara, CA. CELO: CELO Europa, 1143 Manhattan Avenue, Manhattan CA 90266. 714-643-2801. 213-545-8843/4133. 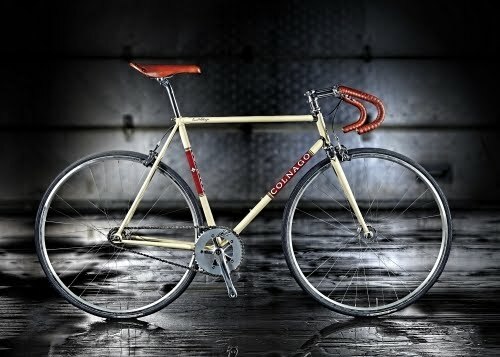 Built by Colnago, imported by Marcel Calborn. CENTURION: Western States Imports, 4030 Via Pescador, Camarillo CA 93010-9864. 805-388-5890. 1837 Dehavilland Drive, Newbury Park CA 94301. 805-449-0421. Japan/Taiwan/Italy. Flat sided seat stay cap. Unicrown fork. CERA: Cees Raas, uncle of Jan Raas is builder. Goes, Heerenhoe, Zeeland, Netherlands. CESARE M: Italy. Once imported by Gus Betat, New Orleans. CHANCE, Chris: See Fat City. Apprenticed at Witcomb USA. CHAPELET: France. 1930s, 1940s. Tandem racer. CHARREL: Lyon, France. Top-tier constructeur ca. 1945-1950s. CHARON Cycles: 17 Prince of Wales Road, London, England. N.W.5. 1950 top model Filligree. CHENOWITH, Martin: Colorado. Decal says Martin. CHERRY, John: Project Bike Shop, 676 Main St, Lafayette IN 47901-1451. 317-423-4488. www.cherry.dcwi.com Known to have used Ritchey Logic tubing. CHESINI: http://www.chesini.com/ Founded 1925 by Gelmino Chesini. 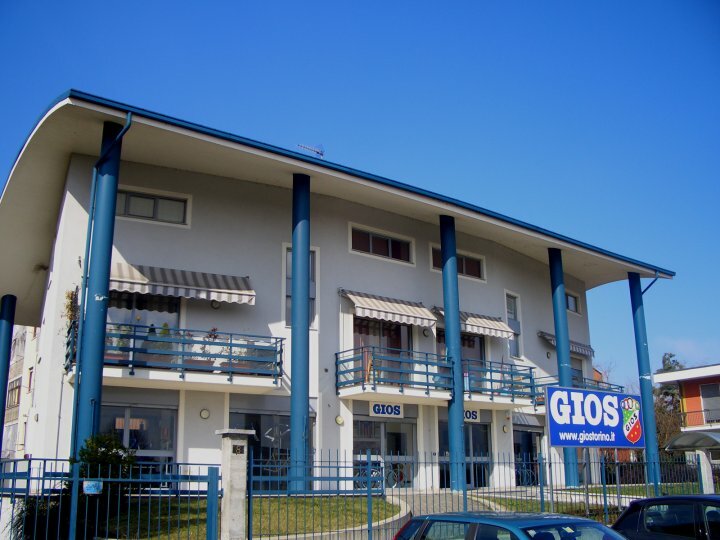 Via S. Paolo, 8/10, 37129 Verona IT 045/8006286. CHILLINGSWORTH, Rich: Tulsa, OK. Made a model called the Alpineer. CHIORDA: 04010 Le Castella, Cisterna Di Latina, Italy. 011-06-9690001. Also produced Legnano. Some were produced in the Bianchi Reparto Corsa professional shop and other contract builders. CHRISTIAN, Kevin: San Luis Obispo, CA. CHRONOMETRO: 257 Winnebago Street, Madison WI 53704. 608-251-5020. CICLI WELKER: Italy. See Garlatti. C.I.D. : Housebrand of Georgetown Cyclesport in Washington DC in the 1970s. Were likely made in England by MKM. CIGNAL: Low end of the Jamis line. CILO: Switzerland. Security Bicycles, 32 Intersection Street, Hempstead NY 11550. 516-485-6100. 800-645-2990. CIMA GRAPPA: European Cycle Imports, 410-472-9478. Columbus, Reynolds & Dedacciai in 97. CINELLI: http://www.cinelli.it/eng/index.htmlVia Egidio Folli 95, 20134 Milan, Italy. 011-39-2-2641-1790. Corso Bicycle Distributor, 349 W. 14th St., New York NY 10014. 212-691-3770. Euro-Asia Imports, 3935 Foothill Blvd, Suite A, La Crescenta CA 91214. 818-248-1814. Founded by Cino and Giotto Cinelli in 1947, initially in Florence. Cino moved the company to Milan in late 1940s. Since 1978, owned by Columbo, makers of Columbus tubing. Also makes lugs, BB shells, handlebars, stems, and tape. Designed bicycle for Coppi, which became the forerunner of the Supercorsa. Master builder was Luigi Valsasina until just after Cinelli sold the company to Columbus. Early models had headbadge. Later models had chromed lugs for the Supercorsa, small C in lugs, Cinelli spelled out on bottom of bottom bracket shell. Seat lug had three small holes on top point, with one in back. Seat tube was 26.2 mm sleeved. Full sloping fork crown. Campy dropouts. Binder bolt through seat stays in a fastback design which is characteristic of the Supercorsa. CINETICA: Italy. Founded by Andrea Cinelli. 011-39-2-26412555. Carbon fiber monocoque. CIOCC: Italy. : http://www.ciocc.it/ Excel Sports, 3275 Prairie Avenue, Boulder CO, 80301. 303-444-6737. Veltec Boyer Sports, 1793 Catalina, Sand City-Monterey CA 93955. 408-394-7114. Zarr International, 84 Lenox Avenue, Stamford CT 06906. 203-348-9703. Founded by Giovanni Pellizoli. Lugged steel. Campy dropouts. Investment cast lugs. CIOCC engraved in BB shell. Italian threading. Columbus tubing. Built some of the Concorde frames. CIRA, Kurt: with Alan Pearce. Rainbow Jersey, 2613 E. Hampshire, Milwaukee WI 53211. CLARK, Geoff: England. Decal says made in Bradford-Yorks. Reynolds tubing. Early 70s. CLARK-KENT: 220 West Alemeda, No 19, Denver CO 80223. 303-935-8289. Closed 95. CLEMENTS, Ernie: Telford, Shropshire, England. Up until 50s. Racer and later manager of Falcon. Died in 2006. Additional information from Cycles Clements, New Street, Ledbury, Herefordshire, England. HR8 2RJ. CLEVELAND: Canada. 1920s. Made by CCM. CNC: Raymond Fletcher, Paris, France. Used by Soviet national team. COLEMAN: Chuck & Doug Coleman, Dayton, Ohio. Custom steel. 916-898-1427. COLIAN: Tempe Bike Shop, Tempe AZ. Built by Colin and Ian Laing. Known to have used EL tubing. COLLIER, Jim: England. Built at Witcomb, Hobbs of Barbican and Gillott. Trained Ron Cooper and Richard Sachs. COLNAGO: http://www.colnago.com/ Via Cavour, 19-20040 Cambiago, Milano, Italy. 011-02-9506077. Founded by Ernesto Colnago in 1954, although he worked as an independent as early as 1952 . Began as a 12 year old apprentice in 1944. Worked for Gloria in 1945 and with Masi. Ridden to World Championships by Eddy Merckx, Giuseppe Saronni, and Joop Zoetemelk. Choice of many teams. Columbus tubing. Engraved seat stay caps. Sloping fork crown. Campy dropouts. Clover leaf cut-outs. Profil CX 83-85 SL w/ ribs. Arabesque 85 SL w/ ribs. Sculpted lugs. "While no frame fabrication was being performed, there were still some items of interest. Inside the Pinarello factory there is quite a bit to see including stacks of raw CF frames, a computer-aided design station, assembly areas, specialized fatigue-testing equipment used to test randomly selected frames and components, and a high-tech painting and decaling areas. You can also still see experienced craftsman using custom jigs to check quality and tolerances on each CF frame prior to painting." "What makes a great ride? The scenery…the challenge… the history? We all ride for different reasons and the above traits ring true for me when I make my assault up the Salto della Capra of Monte Grappa in the Veneto region of northern Italy. When arriving in Venice you wonder where all this great climbing is since you spend over an hour in the car on the flat Veneto plains. Then you start to see in the distance the outlines of Monte Grappa. This is the first mountain range you encounter, the pre-Dolomites of the Dolomite Mountains. Historic Monte Grappa sits at 1775m/5769ft high and has five climbs to the summit, two from the north side, two from the south side and one way up from Monte Tomb on the east side which includes the Salto della Capre climb. The brunt of this 22km climb which starts off with the “Salto della Capra” (the jump of the goat) will pose a big challenge, do to the steepness of these 8 kilometers of narrow road! This section of road will take over an hour to conquer! The climb starts at “Quattro Strade” the (four streets) which is the intersection of four roads in Pederno del Grappa. This ride starts off easy at about a 5% grade for 1km. When you reach the roundabout at the center of Fietta, you take the 2nd right turn and you start to get a taste of Grappa at 10-16% grade right off the get go! This is just a warm up to what lays ahead, which lasts for 2.6kms. When you reach the local bar, named “Il Gallo” the (rooster tavern) you bear right onto a narrow road. This road winds through the forest of trees and the start of agony for the next 8kms of 28 switch backs to the top for this climb. For the next 4.6kms the grade is difficult 8-12% as you eat up the long stretches of road cut into the rocky mountain ledge between switch backs. Then on a left hand switch back you see a metal retaining wall that holds the jagged rocks back, at this point, watch out! It’s you against the mountain and on the way up you would be lucky if you meet a vehicle on the road, never mind another cyclist! Something funny happened on this mountain while I was climbing. I could hear in the distance behind me an approaching pedal moped. It turned out to be a girl who over took me on this 8% grade. About a kilometer up the road I rounded a tight right hand turn and to my amazement, there she was, the girl that had passed me earlier pushing her running moped up this 16% grade since the moped could not continue anymore with her aboard. This is a first I’ve seen, a moped that couldn’t make it up the road on its own power because of the grade of the climb. The road gets even narrower and the steepness goes up to 16-18% then 22-26%. I’ve even seen a flash of 30% on the GPS… this really pitches up to the sky! All of a sudden the switch backs get shorter and shorter as the road gets steeper and steeper and what’s that like you ask? Well, it’s like doing track stands up hill! Do to my size of six foot three and nearly two hundred pounds I almost always climb in the saddle turning at 38 rpm with 39/29 gearing. It’s so steep it is hard to keep the front wheel on the ground on every pedal stroke. It’s also the only time I nearly fell down going uphill! I did a sharp switch back turn and the front tire skipped sideways about six inches while trying to keep the front wheel from sliding out from under me! I’ve even busted a chain on this section of climb…no sense repairing it since all I had to do is coast down the mountain to where I was staying, one hour away! Now you are 5.7kms into the climb and the pitch comes down a bit around 12-13% enough to get a little bit of a spin back into your legs. You start to breathe a little easier before the final, last kilometer push of a relentless 16 -17% of punishment as the switchbacks again get shorter and steeper as you near the top of this pass. You have reached the half way point of this climb to the top of the 22km Monte Grappa journey and the toughest part of this climb is behind you. Now you have a chance to catch your breath, take in some water, refuel the body, and assess how you feel to continue for another 11kms. You start a decent for the next 2.3 kms which includes a 16% section of road which is mostly narrow, winding, and just wide enough for one car to pass. The end of the decent around 14.3kms is marked by some watering holes on the left. Then the narrow, winding road starts its uphill rise again at about 6-10%. You pass through three rustic tunnels dug into the cliff walls that give way to dramatic views of the valley floor below. You continue like a ribbon winding along the edge of the mountain until the road bisects the “Campo Croce” road which comes up from Semonzo on the south side of Monte Grappa at 19kms. Just 3kms from the top, you take the right turn for another 1.8kms at 10% grade to the final right hand turn. It is here the last stretch of 1.2kms around 6% grade you see in the distance the WWI monument that houses the fallen from the war and just below a restaurant and bar which is an inviting sight knowing you have reached the top or “Cima” Grappa. Once you stop and have a chance to rest you notice the great granite monument and WWI museum and the panoramic views. This mountain top is usually thriving with people from hikers, to bikers, people in cars and buses, all enjoying the beauty and history all around. To the south you see the city of Venice some 90kms away in the waters of the Adriatic Sea and to the north the spectacular sights of the jagged peaks of the Dolomite Mountains. You are surrounded by fields and pastures on the mountain that are dotted by the many “Malgas” or (mountain farms) that are the homes to the animals which are brought up from the farms below during the summer months for production of their own milk and cheese. This setting couldn’t be more historic in Italian WWI history and according to war veterans and alike the Italians held off the advances of the Austrian/ Hungarians into northern Italy on the battle lines along Monte Grappa and the Piave river. Some 12,615 Italian soldiers gave their lives to stop advancements of the Austrians to help make Italy as we know it today. The best part of this ride is taking in what the mountain had to offer in a few hours. From the challenge of ascending one of the toughest climbs in our area, the Salto della Capra, to passing by the many malgas as you wind through the pastures on the way up the mountain, to arriving on top of the world on historic battle grounds for some breath taking views seen all around." Photo: Monte Grappa... and to the right is the Salto della Capra...in the middle the tunnels and on the left the climb to Cima Grappa. Aldo and Marco Gios are inaugurating their new GIOS showroom on April 17, 2010, in Volpiano (TO) at corso Kant, 6. 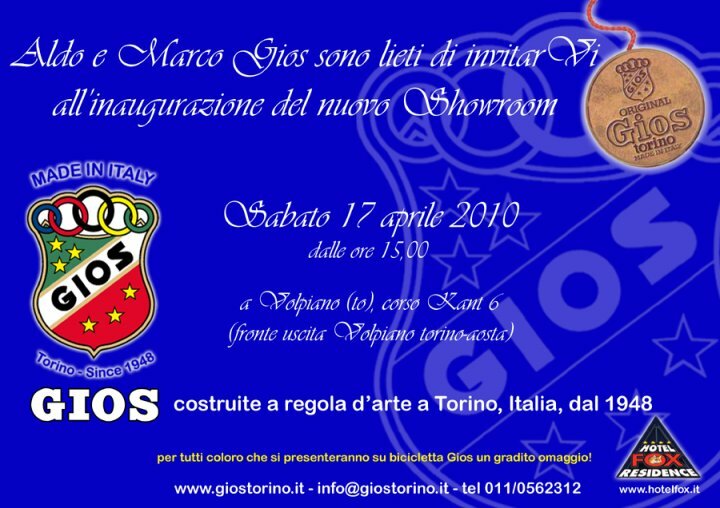 All GIOS fans are welcome; see photo for email address and telephone number to let them know you are coming. See here to get to links about recent stories about GIOS, its two parts, etc. 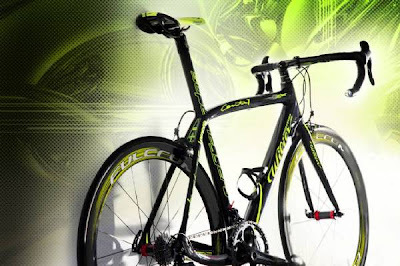 2011 Campagnolo, Fact or Fiction? I'm still trying to wrap my head around why these photos appear on a Taiwanese (?) website but nevertheless the good news, if the photos are true, is that riders would have some good choices for alloy brake/shifter options in the Campagnolo groupsets. 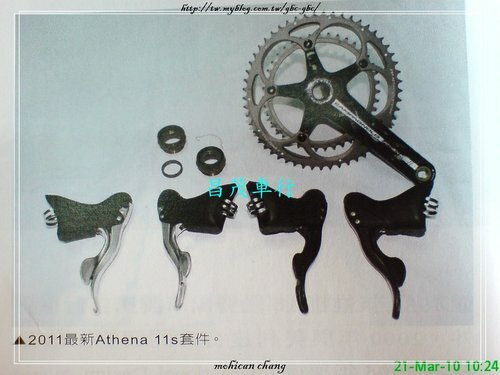 It appears that alloy levers will be available in the 11 speed Athena and 10 speed Centaur and Veloce groupsets. 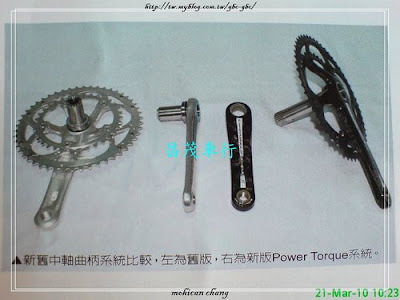 There is also a cyclocross crankset pictured. The photos are from here (the top photo is Athena 11s, the remaining photos are labeled). In Verona there is an annual end of the cycling season Mass for cyclists. In New York City there is the "Blessing of the Bikes" at the start of the cycling season in which the Reverend Canon Thomas P. Miller S.T.M., of the Cathedral Church of St. John the Divine, sprinkles bikes with Holy Water. There is also a moment of silence to remember those cyclists that have been lost in the past year. A Cipollini ridden SAECO Cannondale can be found at Brian Rourke Cycles in Stoke On Trent, England. Thanks to reader Mike for sending in the photo. My own build of a made-for-Cipollini Cannondale can be seen here. I am still looking for Coca-Cola bottles in the small .66 Elite water bottle size. 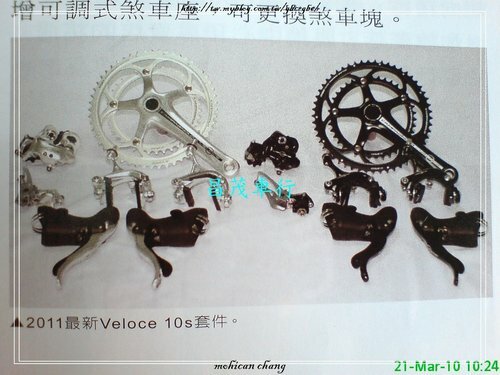 Back in October, 2009, we published an article announcing the Campagnolo 12-29 cassette for 11 speed. Subsequent articles discussed the benefits of a 12-29 with a compact crankset, and in December came the first hint that the Campagnolo triple might be on the verge of extinction. 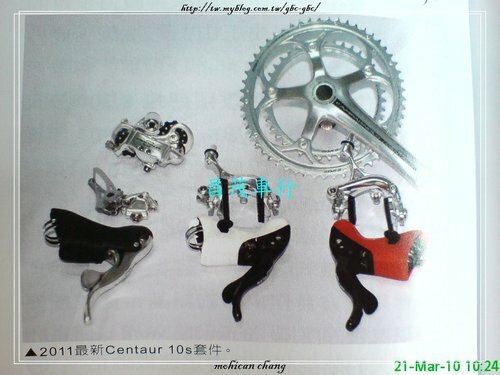 The article from Bike Europe (March, 2010), summarizes the situation of Campagnolo compact vs. Campagnolo triple and includes another hint that the Campagnolo triple era is ending. As an aside, I should also mention that SRAM has announced a new road group, APEX, that allows a 11-32 cassette with a 50/34 (but requires a long cage derailleur). "For its 2010 component range, Campagnolo presents a brand new 12-29 cassette for 11-speed drivetrains. 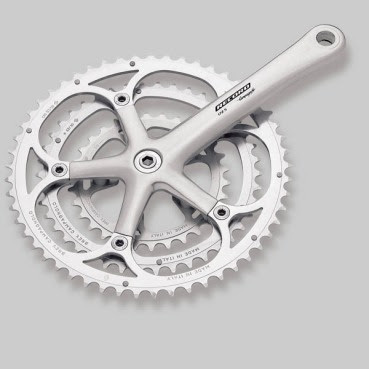 The new cassette exceeds the commonly used 28 teeth of the sprockets offered by the competition and enables the 11-speed drivetrain to be even more versatile. 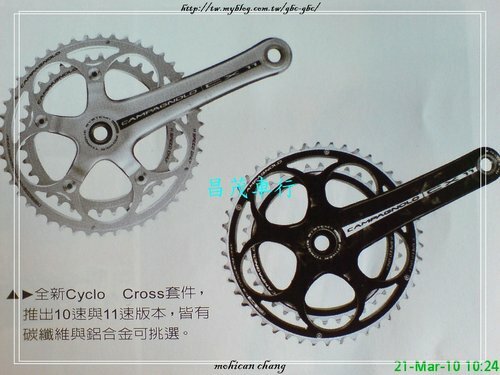 In fact, the new 12-29 combination used with a compact 50-34 crankset generates metric developments analogous (2,49/8,84m) to those of a 53-42-30 triple crankset. The use of a compact crankset instead of a triple also makes it possible to obtain better chain alignment and a substantial weight reduction. The really big news is that Campagnolo has managed to keep a single rear derailleur configuration, avoiding the problem of the double option: choosing a derailleur with medium or short arm. As a result there is just one rear derailleur option, which works precisely and optimally from the 11-tooth cog to the 29-tooth, in combination with all available Campagnolo 11-speed cranksets. The 12-29 cassettes are already available for the Super Record, Record and Chorus. According to Campagnolo the era of the triple is drawing to a close, thanks to the 11-speed technology in combination with the new 12-29 cog set. 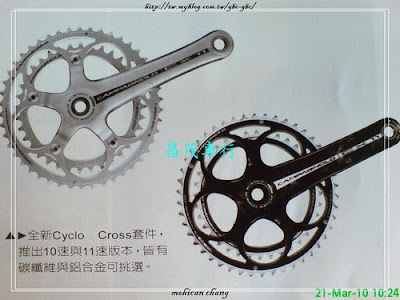 Some years ago, with the introduction of the compact crankset, the number of users of the triple fell considerably, marking a trend that has continued year by year. With Campagnolo’s introduction of the 11-speed group sets last season, the advantage given by the compact became even more pronounced. The classic triple configuration (53-42-30) was often combined with a 13-29 sprocket set. When this configuration is compared with a compact 50-34 and Campagnolo’s the new 12-29 sprocket set, it is clear the new 29 tooth cog, paired with the 34 tooth chain ring of the compact, allows metric developments similar to those of a triple crankset with a rear 29 tooth cog. This difference is only 30 centimetre. Even for the hardest ratios, the two configurations are very close in terms of metric development: the 53-13 of the triple compared to the 50-12 of the compact has a difference of only 20 cm. The lower weight, a reduction of the Q and U factors, less intersection and overlapping of gear ratios, and consequent better chain alignment are additional advantages with the compact set-up." "Our original intention of the Men of Steel Racing Club was to fill the gap in the cycling world between the tourist who still ride and appreciate steel, the collectors of vintage steel bikes who see them as works of art, and everyone else. Our mission statement is "To get steel frame racing bikes, off the walls, out of the basements and on to the race course". With that, we had a series of steel frame only races in 2009, which were very well received. Steel is still used in track and cyclocross but that is about it. We hope to change that. We would hope that this would catch on. It provides for an inexpensive bike to race and one that if you crash, you can fix it. A 20 year old Masi can be just as competitive today as it was then, at a fraction of the cost. We would really like to see USA Cycling step up and require steel bikes for their junior riders. It would control costs and would allow for more participation. For 2010 we decided to create a team that would compete head to head against others on steel frame bikes, both vintage and modern. We chose De Rosa as the name carries so much weight and the quality is second to none. We have 5 on our A team that will be riding these. To be honest, very few believed that a new frame, even kitted with modern components could match modern carbon bikes. We have proved them wrong. The weakest part of our bikes will be the riders. We also wanted a team kit that reached back to the days of cycling's classic era and I think we hit the mark. Our sponsor, Mt. Borah, did a great job with bringing our design to life. We are also collectors and have nice displays at our races. Pogliaghi, Masi, Gios, a Basso Gap and Ascot, Somec SR, are just some of the bikes we ride and display. It draws a lot of attention. We are also thrilled with all the talk about us on various blogs and forums." Photos: team training camp in Brown County, Indiana, a few weeks ago; Brown County was the site of the 1987 Pan Am Games and the roads shoot up to 21%+ in some spots (click on photos to enlarge). The deadline for any changes to the list is May 3rd. Take a peek at my CINELLI ONLY blog for photos of an Andrea Cinelli CINETICA. Stories for the Italian Cycling Journal about rides, granfondo, having a good time cycling in Italy, Italian cycling history, etc. are very welcome. Contact me at veronaman@gmail.com. There are more than 1,300 stories in this blog. The search feature to the right works best for finding subjects in the blog and there is also a translate button at the bottom so you can translate each page. Cinelli fan? Visit CINELLI ONLY. Italian cycling magazine CICLISMO has presented its awards in the 6th annual "Bike of the Year" contest. The winners, in each category, were based upon voting by readers over the last several months. "My teammate Juan Antonio Flecha filmed the descent off the Cipressa with a helmet camera while we were out pre-riding the race course. The Cipressa and the Poggio are the two decisive climbs in Milan Sanremo where the descents are as important as the ascents as position and a rider’s ability to handle his bike often determine the outcome of the race. Yearly, a rider crashes in the one of the numerous hairpin turns coming off the climb. The road surface is smooth and the climbs are in the final hour of the race so the speed will be high. Every rider is tired and on his limit from the distance and the intensity of the race so errors are made and splits in the peloton occur. When the peloton reaches the coast road after the descent off the Cipressa the peloton will be in a long thin line and will often split near the back of the group as riders are unable to maintain the speed." "Oscar Freire is like that: he wins when you don't expect him to. Sometimes, as was the case in the Classicissima number 101, he dominates - without the help of his team, without giving his rivals the chance to respond to that one, lethal, strike. The Spanish Rabobank rider convincingly won the contest with Tom Boonen, second, and Alessandro Petacchi, third. And following his wins in 2004 and 2007, the third Milan-San Remo - the same number Fausto Coppi won - now gleams brightly in an amazing trophy cabinet, which already holds 3 world titles. THE SPRINT — The victory tally again stands in favour of foreign riders: 51-50, including the last four. And yet our riders all had their moments: Francesco Ginanni on the descent from the Cipressa, Vincenzo Nibali coming down the Poggio, Filippo Pozzato with a counter-attack after Gilbert's charge in the final 10 km of the race. And Petacchi held off the attacks on the San Remo's final climb, which yet again did not prove to be decisive. But there was nothing that could be done about the sprint. Freire stayed on Bennati's wheel, guided by Kreuziger; Boonen and Petacchi were behind him. When Oscarito got up on his pedals, the Liquigas-Domino rider Bennati stayed put (he finished fifth). Petacchi? Left behind. And it was Freire relatively easily, with Modolo, the first-year professional with CSF-Colnago, an excellent fourth. Boasson Hagen and Cavendish (puncture on the Turchino) were among the day's disappointed riders. Cunego, our hope for the northern classics, had a good race. THE START — The day began with an extended break by Ratti, Caccia and Piemontesi, who got away after 1 km and built up a lead of more than 20 minutes; that was followed by the Brazilian rider Fischer falling on the decsent from the Turchino, which forced him to retire with a broken collar-bone, and the attack by the Bouet-Grabovskyy duo on Capo Berta. A taste of what was to come on Cipressa. A RELAXED PETACCHI — "Winning the San Remo is always important, but this is the third...," said Freire. "I'm going really well this year (this was his fourth win, ed. ), and I hope I can keep it up. I dedicate this victory to my team: I was the only one who had won it twice, but no one thought of me as a favourite. We'll see if I'm among the favourites next year." Petacchi was relaxed: "I rode a great San Remo. I was amazed how well I went on the Poggio. I knew Gilbert and Pozzato would take off, so I tried to stay with them and I didn't realise there was a gap behind us. Then on the descent I tried to stay in front to avoid any risks." Pozzato: "We had already decided that if things didn't go well on the Poggio, I would try to make a move in the last two kilometres. Congratulations to Oscar." Boonen: "Freire was great. I was also going well, I was on his wheel and I tried to anticipate him, but Oscar won by two bike lengths. After a sprint like that you can only say that Oscar was the best." This article is written and contributed by Mark Mahan. La Classicissima or La Primavera, Milano-San Remo is the first big appointment on the year’s racing calendar and tomorrow’s race promises as always to be electrifying. Being the lottery that is however, the prognosticators have been plying us for days now with the eternal question; will it come down to a sprint or will a break get away on one of the famous “Capi” or sharp little climbs that dot the final 40 kilometres? Tomorrow’s edition is the 101st and the sprint versus the breakaway has been a theme at Milano San Remo from the very beginning. It wasn’t until the 4th running of the race in 1910 that a significant gap was recorded between first and second place, a full 61 minutes. Eugene Christophe won one of the more dramatic editions due to horrendous weather, his winning time was 12 hrs. 24’minutes. In 1917 Tano Belloni, the first racer to be called “The Eternal Second” won, beating the first “Campionissimo” Costante Giradengo. Belloni attacked alone in the town of Ovada, 166 km. from the finish, again in awful weather conditions. Giradengo arrived 11’48” later, a half an hour in front of the third place rider. The very next year, 1918, the roles were reversed, this time it was Giradengo who attacked from even further out. Wouldn’t you know it, in atrocious weather, that made the dirt roads muddy paths. Belloni chased alone, arriving 13’14” behind “Il Gira” with third place coming in at 59’ minutes. Only seven riders finished the race, the last place came in at 10:00 PM, four hours later. The Milano -San Remo of 1946 was much more than just a bike race. It was virtually synonymous with the re-birth of Italy after the end of the WWII, the expectations and agonistic tension were off the charts. Professional racing had more or less ceased after Fausto Coppi set the new hour record at Milano’s Vigorelli velodrome just before heading off to war in 1940. That was the same year he won the Giro d’Italia in his first time out, as Gino Bartali’s “gregario” or domestique. After the war ended Coppi paid a visit to the Legnano team in an attempt to get his job back, the door was closed though, the team deciding to opt for Bartali who was an established champion. The Bianchi team chose to gamble on the younger racer, giving him a handsome contract, the contents of which somehow made it back to the ears of Bartali who demanded the same treatment from his team, Legnano. They turned a deaf ear to Gino’s pleas. And that brings us to the start of the 1946 Milano- San Remo. Coppi knew he had to make a bigger than life impression. He also knew that he wouldn’t be on equal footing with Bartali if it came down to a sprint finish. With that in mind he trained like an obsessed monk the entire winter, accumulating over 7000 kilometres before lining up at the starting line in Milano. Over 2000 of those kilometres were ridden on a fixed gear bike, something that was unheard of at the time. He had told his brother Serse, also on the Bianchi team, that his job was to cover Bartali and make sure that he didn’t chase him down. Little did Serse know that Fausto was going to attack almost from the gun, going off with a group of no names at the town of Binasco, just 10 km. into the race. But they were riding for glory and behind them all eyes were on Bartali who was seemingly disinterested in Coppi’s attack. Which takes us back to the contract dispute, Gino was riding the race so as not to infringe on his contractual obligations to his team but he wasn’t racing, he was simply riding. By the start of the Turchino climb, freshly re-opened from the war closure, Coppi had ridden everyone off his wheel except for the French rider Lucien Teisseire. By the top of the climb Coppi was alone, the solo escape, which was to become his trademark for the next 15 years, began that day. His lead increased inexorably as he proceeded up the coast towards San Remo, his fluid, powerful pedal stroke never faltering. By the time he crossed the finish line his lead had grown to 14 minutes over Teisseire, Bartali rolled across 24 minutes later, his face a dark mask. Their rivalry had initiated in earnest that day and wasn’t due to end for many years to come, to the infinite delight of Italian cycling fans. In so-called modern times really only two important attacks from a long way out have succeeded at Milano-San Remo. That of Gianni Bugno in 1990 and then the following year by Claudio Chiappucci. In the edition won by Bugno the first selection was created after just 20 km. by a strong wind that broke the peleton into three groups, Bugno being in the lead one. By km. 44 the first two groups had come together but behind a whole slew of big names were riding their eyes out trying to catch, amongst them was defending winner Laurent Fignon, going for the hat trick at MSR. The front group was on the boil, driving a furious pace that never seemed to drop below 45-46 km. per hour. Their lead increased despite the determined chase from behind, by km 168 it had ballooned to 11 minutes and at the town of Varazze 80 riders abandonded including Fignon. Up front the lead group had dwindled, casualties of the furious pace setting dropping off the back. Flying through the town of Imperia at km. 261 a Sicilian rider named Canzonieri attacked off the front, Bugno was the only one to follow him. Working smoothly together their lead grew to 41 seconds over a chase group that included Argentin, Skibby, Golz, Sorensen, Mottet and Fondriest. Heading into the “Capi”, those leg burning final climbs along the coast, Bugno decided to rid himself of his companion, dropping to a lower gear and jumping away decisively. By the top of the Cipressa his lead over Golz and Skibby was 18”, it was 28” over Delion, Fondriest and Colotti with what was left of the main group at 43”. At km 278 Bugno’s lead was 12” over the six men who had joined forces in the chase, the group at 34”, the race was still wide open. On the final climb of the Poggio, Bugno was still looking strong as behind him Rolf Golz surged, dropping his partner in the chase Jesper Skibby, passing over the top of the Poggio 15” in arrears. Both riders flew down the descent risking at every hairpin turn, Bugno floating just out of reach as he made it onto the flat run in to the finish where he won with his hands raised in the air, the classic Bugno victory salute. It wasn’t the last time that Gianni would have his “tifosi’s” hearts in their throats, hoping against all odds that their man would hang on for the win. The very next year it was Claudio Chiappucci’s turn and his daring attack on the descent of a fog laden, rain soaked Passo Turchino blew the race wide open. His move had been planned much earlier and by taking powerful teammate Guido Bontempi with him, Chiappucci assured himself of better than even odds at staying away. Joining the two Carrera men were Marino Lajarreta, Charley Mottet, Rolf Sorensen and Adri Van de Poel. By the time the rest of the pack realized that Chiappucci was up the road their lead had grown to 40 seconds. There were just over 100 km. to the finish. Giving an idea of the pace being set, it took three flat lander rolleurs like Jelle Nijdam, Peter Stevenhagen and Thierry Marie 45 minutes to bridge up to the breakaway. Once this trio had hitched their cars to the train the race was on for real. As they rolled over the Capi the speed, the weather the fatigue began to take a toll and one by one, riders in the break began to slip off the back, Chiappucci driving it to keep the pace high. By the time the two remaining breakaways, Chiappucci and Sorensen, had reached the foot of the final climb up the Poggio, their lead over the pack was 1’40” and they knew that one of them was going to win. Knowing that he had no chance against the faster Dane in a sprint finish, Chiappucci attacked with everything he had left going up the Poggio, dropping Sorensen and just managed to negotiate his way down the other side without crashing. 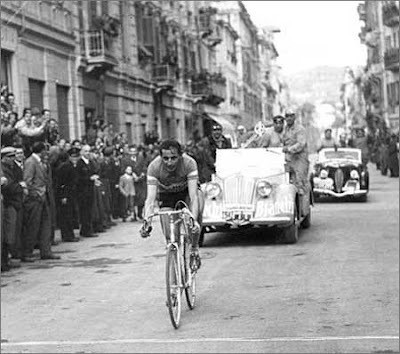 His solo win in Corso Cavallotti after a daring attack from far out propelled him into the hearts of the Italian tifoseria. And now, in just a few more hours, the race caravan will begin the march towards San Remo and a new Classics’ season. Maybe it’s the romantic in me but I’d like to see a daring attack from a far, like in bygone years. Soon we’ll know. 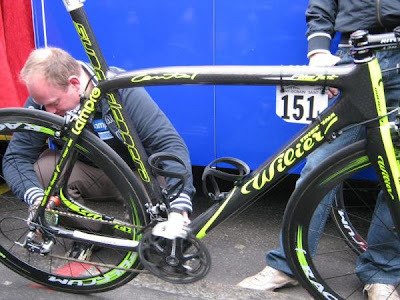 Alessandro Petacchi will use a new bike from Wilier Triestina for Milan-Sanremo tomorrow. The Cento1 Superleggera frame weighs less than 900 grams and has had reinforcements added to allow Petacchi to avoid even the slightest loss of power in the sprints. In the latest version of his bike the rigidity was in the head tube and bottom bracket. The bike also has new graphics with matching wheels. 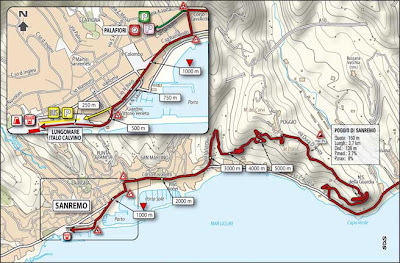 The 101st edition of Milan-Sanremo is tomorrow. For the 100 previous editions of the race the number of victories by Italians and foreigners stands at 50 each. Two hundred riders, representing 25 teams, will start hoping to write their names in the history books. The Italian favorites are Petacchi, Pozzato, Cunego and Bennati. The foreign favorites are Boonen, Gilbert, Cancellara, Boasson Hagen and Freire. Outside favorites include the dueling Scarponi and Garzelli from the just concluded Tirreno-Adriatico, Visconti, Flecha, Farrar, Gerdemann and Cavendish (last year's winner who had health problems this year putting him behind schedule in his preparations). Lance Armstrong announced this morning that he will not start due to acute gastroenteritis. Michele Dancelli will be present on the occasion of celebrating his 40th Milan-Sanremo anniversary victory from 1970. That year Dancelli was in a 200km escape and rode 70 km solo to victory. 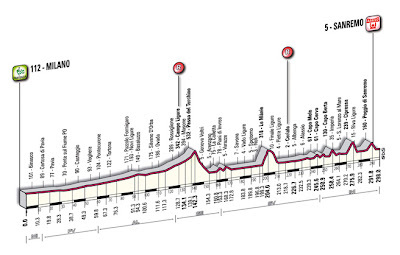 We are at -2 days before the "Classicissima" (also "la classica di Primavera") , Milan-Sanremo, which will begin on Saturday from Castello Sforzesco in Milan and finishes 298 km (185 miles) later on the Lungomare Italo Calvino in Sanremo. Last year was the 100th edition of the race which is one of the "monuments' of cycling. It is the longest one day race on the professional calendar and coming early in the season it is a true test of endurance. The race will be broadcast in Europe by RAI and Europort. The USA is carrying it (perhaps delayed, best to check schedule) on the Universal Sports (US) channel. RAI will be streaming it from www.rai.it; you can also check at www.cyclingfans.com to pickup streaming links. Broadcasting is set to start, picking up the race nearer to the finish, at about 1450 Italy time. 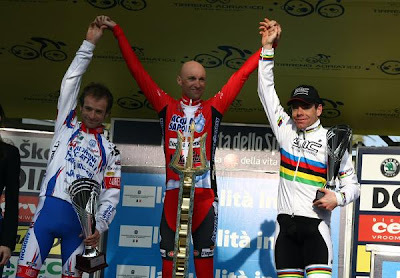 The seven stage Tirreno-Adriatico was a very good race with a particularly exciting final stage in which the race was won in dramatic fashion. At the start of stage seven, race leader Michele Scarponi (Androni Giocattoli) had a two second lead over second placed Stefano Garzelli (Acqua & Sapone). The stage had two intermediate sprints for time bonuses and in each Garzelli was able to win one second. That left Scarponi and Garzelli tied on time. However, Garzelli became the virtual race leader based upon previous stage placings. Scarponi was unable to take any bonus points at the finish leaving Garzelli as the race winner. 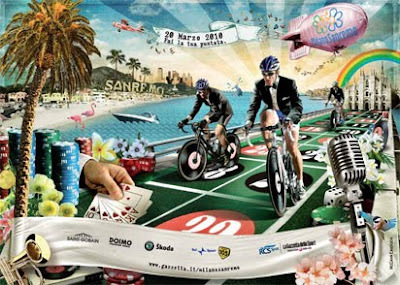 Saturday, March 20th, is the 298 km Milan-Sanremo. Breaking news is that Lance Armstrong has decided to race. 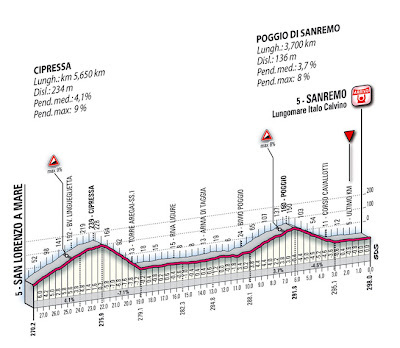 More Milan-Sanremo race details tomorrow.